Rammed earth walls are very durable. They are stabilized with a small amount of portland cement and rammed to a very hard state. The walls cure to strengths comparable to those of concrete and like concrete they will not erode from wind driven rain. These walls are unlike both cob and adobe in this respect. They may be sealed but it is not absolutely necessary. The insulation is buried in the middle of the wall where it is sealed and protected from insects, UV radiation or any sort of degrading influence. Because the walls are very strong and reinforced with steel they can be engineered by a licensed structural engineer (SE) to withstand the forces of an earthquake. Once the walls are constructed the forms are removed and the walls are essentially finished at that point. There is no finish coat of stucco or plaster required. There is no painting needed. The walls are complete. They may be sealed or not. The detailing can include an exterior with no trim around the windows and doors, if desired, resulting in very low maintenance. 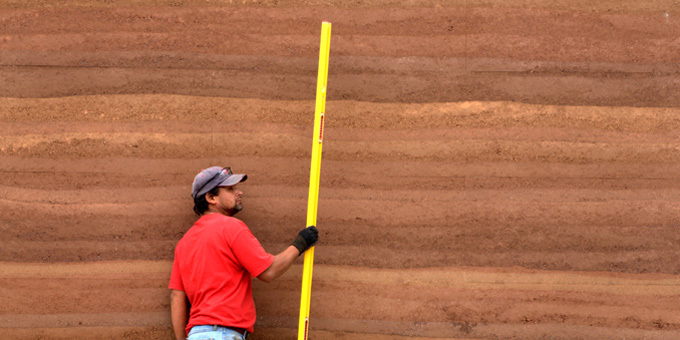 It is appropriate to use stabilized rammed earth for landscape walls even in wet climates such as the Pacific Northwest.